Originally published under the title, "Turkey's Obsessive Fantasy." 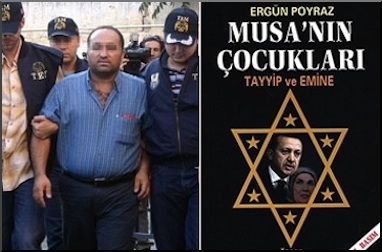 Turkish writer Ergun Poyraz, who wrote the 2007 anti-Semitic bestseller The Children of Moses, was later sentenced to 29 years in prison for "conspiring" against the government. In his 2007 bestseller book, The Children of Moses, quirky Turkish writer Ergun Poyraz claimed that then Prime Minister [now President] Recep Tayyip Erdogan was a crypto-Jew. The book's cover depicted Erdogan and his wife in a Star of David, and portrayed Erdogan as a secret agent of "international Jewry." Only six years after the publication of The Children of Moses, Erdogan, along with Iran's supreme leader, Ayatollah Khamenei, and UN official Richard Falk, was on top of the Simon Wiesenthal Center's annual list of the top 10 anti-Semitic and anti-Israel slurs. If one asked Poyraz, he would most likely explain Erdogan's deep anti-Semitism with another conspiracy theory: his public anti-Semitism is a perfect "disguise" for him to serve the Jews. Erdogan's ideologically inherent anti-Semitism, often expressed in a blend with his anti-Zionism, is only too well-known internationally. In 2013, the year he "won the award" for his anti-Semitism, he said that Zionism was a crime against humanity. The idea that there are crypto-Jews or secret friends of Israel in their midst is increasingly popular with Muslims. The Middle East has never been short of conspiracy theories. But the idea that there are crypto-Jews or secret friends of Israel is increasingly popular with Muslims who are waging political, ideological and sectarian wars among themselves. Recently, a top Iranian military commander accused Saudi Arabia of following the footsteps of Israel. "Saudi rulers follow Israel as a role model," said Brigadier General Mohammad Ali Jafari, commander of Iran's Islamic Revolution Guards. Only a few days earlier, Turkish Prime Minister Ahmet Davutoglu had appeared on television with his own version of conspiracy theories, this time pointing to Egypt under President Abdel Fattah al-Sisi, one of Turkey's regional nemeses, as Israel's "secret ally." Davutoglu said: "A [invisible] hand wants Assad to survive. Just like Sisi ... Neither Assad nor his family has done any harm to Israel. ... Sisi continues with the siege of Gaza. Because for Sisi, Israel's security is more important than human dignity in Egypt." 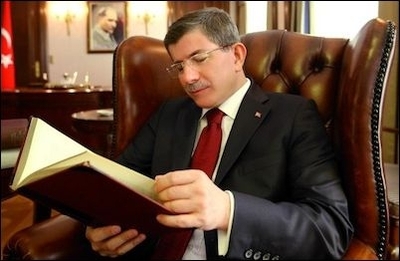 Davutoglu illustrated a stereotypical Islamist's judgment: When I have ideological, political or sectarian cold wars with my co-religionists and they refuse to convert to my worldview, it must be because they are the secret allies of Israel. Turkish Prime Minister Ahmet Davutoglu accuses Turkey's enemies of being secret allies of Israel. The regimes of both Assad and al-Sisi are Turkey's worst regional enemies, because Ankara views them as barriers to the Muslim Brotherhood or similar Islamist regimes in Syria and Egypt. Davutoglu's allegation is deeply problematic for a number of reasons. First, it does not satisfy him that both the regimes of Bashar Assad and his late father Hafez Assad in Syria have been in a state of war with Israel for decades. He openly declares that Syria must "do harm" to Israel. Davutoglu does not hide his annoyance that the Assads' Syria has not done any harm to Israel. To put it in more simple words, the Turkish Prime Minister wants Israel to be harmed. Second, Davutoglu's allegation is at the same time a confession. He says that the Sisi regime in Egypt maintains its blockade against the smuggling of arms into Gaza. That is factual, so it is not wrong. But then he says Egypt does this because "for Sisi, Israel's security is more important than human dignity in Egypt." So the Turkish Prime Minister clearly admits that without Egypt's control over the border and destruction of smuggling tunnels, the Palestinians will smuggle arms into Gaza to commit acts of terror against Israel. The Turkish Prime Minister also admits that he has a problem with Israel's security, that he would prefer an insecure Israel, and he equates "human dignity" in Egypt with Israel's insecurity -- by means of weaponry smuggled to Palestinian terrorists through the tunnels he would prefer not destroyed by the Egyptian government. In a saner part of the world, Davutoglu (and therefore, Turkey) could be accused of openly sponsoring terrorism. He will not be. Instead, a Shiite rival or Sunni enemy might argue that Davutoglu says he is upset by Israel's security because he is a crypto-ally of Israel. The slanderous, defamatory pattern repeats itself -- always in the same conspiratorial way.